Machine is located in the store/gift shop. The building is located on the left as you pull into the main entry area. The store/shop is before the admission gate house. 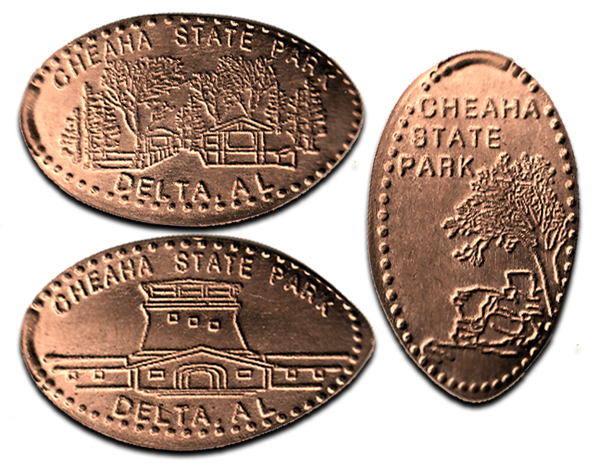 Cheaha s Penny Press offers 3 images, each a portrait of a distinct area of the park. 3) The CCC Observation Tower located at the State s Highest Point. 11/6/2012: Machine is in the same location, all designs are rolling short. Vertical design is rolling the best, all words are visible. "Park" is almost completely missing on trees horizontal design. Only the "R" and "K" are clipped on the tower horizontal design.